In Jewish communities across the globe, stores are stocking shelves with Kosher for Passover (KFP) products. And people with celiac disease and their parents, Jewish or not, are stocking up on KFP foods. What’s the connection? Chametz, or leavened food, has a strict definition according to Jewish law. Chametz is produced when one of five grains, barley, oats, wheat, rye and spelt, comes into contact with liquid and is allowed to rest for 18 minutes before the completion of baking. The complexity of the laws of chametz and matzah means that in practice, any processed food prepared without Passover in mind is assumed to be chametz. Because of this complexity, foods to be sold under Kosher-for-Passover supervision must be manufactured separately. Equipment must be cleaned from top to bottom to remove any trace of chametz, or leavened grains. Any crumb of wheat or oats would render the product chametz, and prevent it from receiving the Kosher for Passover label. Some products are nearly identical to the year-round equivalent, while some require substitutions for ingredients that are not kosher for passover (for instance, corn starch would be replaced by potato starch). Some KFP products may contain matzah or matzah flour. Examples are breakfast cereals, cake mixes, chocolate-covered matzah, and gefilte fish. If this is the case, matzah will be listed as an ingredient. When a product is labelled “non-gebrokt,” it will not contain any matzah product. Gebrokt means soaked. Some jews observe a stringency of avoiding matzah that has touched liquid after baking. 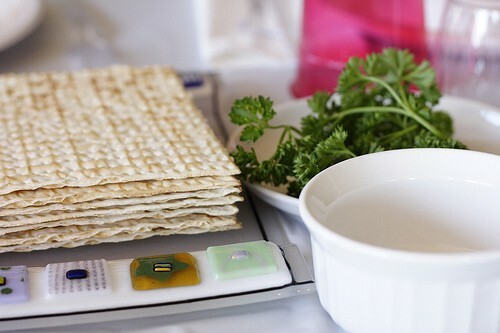 Non-gebrokt products will not use matzah as a secondary ingredient, because it would touch liquid somewhere along the way. Sephardic Jews, of Spanish or North African origin, have two main leniencies compared to Ashkenazi, or Eastern European Jews: Sephardic Jews may eat wheat products that are made from flour combined with juice or eggs and baked according to Passover rituals. This is known as “matzah ashirah” and will also be clearly labelled. Most also eat corn, rice and legumes. In Israel, with its large population of sephardim, there is a wider variety of kosher-for-Passover products that are also gluten-free. Any product containing matzah, matzah meal, matzah flour, or matzah ashirah, etc. should be assumed to contain wheat. Passover products labelled “non-gebrokt” can be assumed to contain no trace of wheat, oats, barley, rye or spelt. In the US, starch in processed Passover foods is likely to be from potatoes. Products marked Kosher for Passover will not contain wheat, oats, barley, rye or spelt unless they are a matzah product, or include matzah among the ingredients. In Israel, which has large numbers of Sephardic Jews, Kosher for Passover products may contain rice or corn as well as potatoes. I hope that this helps celiac sufferers and their families navigate the Passover shelves this time of year. very very helpful post. i will share it with many others who are interested in this stuff. love your new header and layout! Thank you for posting about gluten and Passover. While what you said should be true, people who are extremely sensitive need to be even more careful than simply buying KFP products that lack matzah. Some of those products are made in factories where wheat is being used (it says so on some of the labels but not all) and there may still be issues of cross contamination. I got extremely sick this year from parve kosher for passover chocolate that should have been gluten-free but wasn’t. Passover is a great time to stock up on gluten-free foods but it is still important to read labels carefully. Shoshana, that’s very interesting. I guess a lot also depends on how sensitive you are. Glad you are feeling better, that must not have been a fun way to spend the holiday.